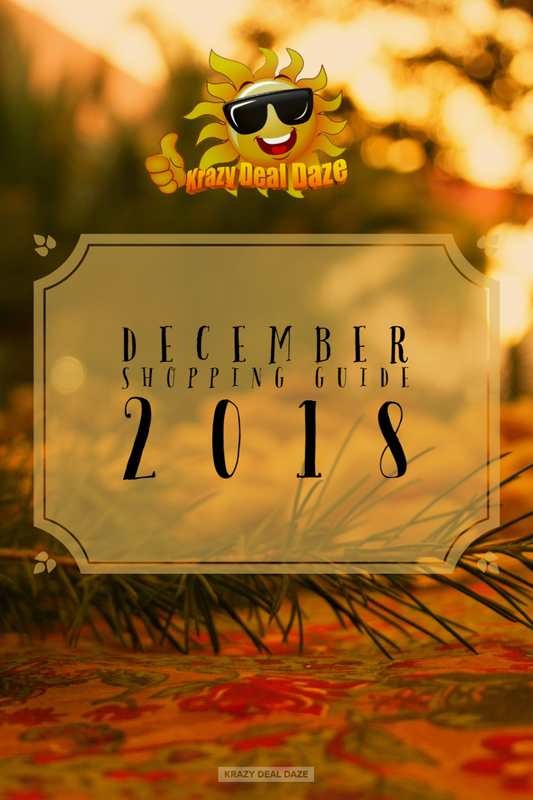 Check out all the Krazy deals we found for December 2018. This post contains paid affiliate links, please read our Advertising Disclosure Statement. That's right it's December and the holiday season is at its apex! We are now all in the throws of the giving season and we are all hunting for the perfect deal on that perfect gift!! Although some of the biggest shopping days of the year are now behind us and we've survived Black Friday, Cyber Monday and Giving Tuesday, don't fret! It's not too late to find some really great deals in the month of December. Besides, we still have Super Saturday coming up! This month be on the lookout for deals, discounts, and sales on toys of course! Also look for deals on winter apparel, Jewelry, holiday gift sets, and electronics. Additionally, if you are in the market for a new car you may find some great deals at your local dealerships as they are trying to meet their end of the year quotas! According to Consumer Reports here is a list of gifts that may be on your Christmas list that you could get deep discounts on in December. Some of the best gifts for the people on your holiday shopping list are also on deep discount in December. Festivus - for the rest of us! Finally, the day after Christmas is the perfect time to head out and start your Christmas shopping for next year! You can find some pretty amazing deals on all those seasonal items that didn't sell, like gift sets, Christmas décor…etc. Please be sure to pay attention to the Good Through Dates that have been included with each deal posted. If no Good Through Date is included that means this is an ongoing promotion with no end date listed. 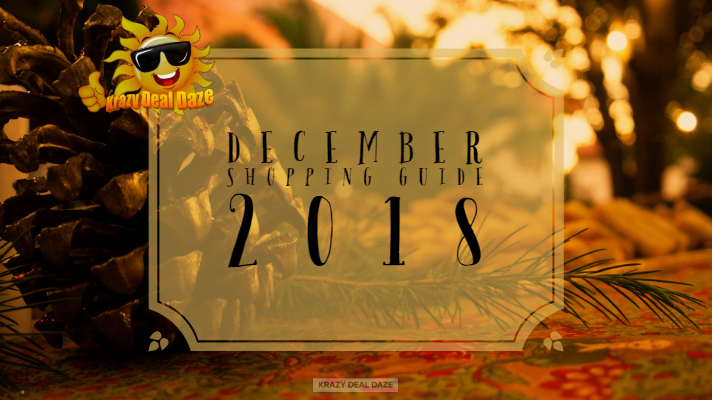 Some of these dates and deals aren’t here yet and are coming up this month or depending on when you’re reading this, those dates may have already passed… Also, you may want to bookmark this page so you can check back regularly as we will be updating this guide as we find more deals throughout the month. Here are some of the deals we have found for December 2018. So let the deal hunting begin!! 3. Extra 30% off almost all items in the Lord and Taylor Premium Brands Shop at Walmart.com. Prices as marked. Offer Good 12/2/2018 through 12/13/2018. 1. Check out Macy's Deal of the Day!! 1. Gaiam's Bestselling Balance Ball Chair now available in 3 new colors At Gaiam.com! Click Here! 2. Roll away the tension with our complete line of foam rollers at Gaiam.com! Click Here! 3. Buy Any 4 Yoga DVDs for $18.98! 4. FREE SHIPPING On All Yoga Pants, Bras & Tanks At Gaiam.com! Good On all Orders Over $75! Click Here! 1. Shop. Earn. Redeem. Repeat. Join Sally Beauty Rewards: Earn $5 just for signing up! 2. Free Shipping at SallyBeauty.com on ALL Orders $50+! 1. Everything Is Just $1 At DollarTree.com! 2. FREE* Shipping To a Dollar Tree Store! Pick It Up At Over 5,000 Locations! *Restrictions may apply. Thank you for stopping by and checking out our December Shopping Guide! Which Krazy Deal are you most excited about this month? Be sure to let us know in the comments below! If you enjoyed this post, we’d be very grateful if you’d help it spread by emailing it to a friend or sharing it on Twitter and/or Facebook. Don't want to lose this? Pin it on Pinterest so you can get back to it later! What's a Daily Goodie Box? Wow! You literally found every single deal huh? Thanks for putting this together. Made my life so much easier! Holy cow that's a lot of deals! The amount of shopping we do continues to scare me but that doesn't mean that I don't keep on going! Whoa that is lot of deals to cover the December month. Even we have something similar coming to this. It also reminds me there are few stuff to buy and I hope they are in our favor. I still have a few friends and family members to shop for. Thanks for putting this list together. I will check out deals on items they would love! So many deals this Christmas! It's indeed the most beautiful moment of the year, full of gifting and celebrations. I can't wait to get started with my Christmas shopping! KrazyDealDaze Copyright © 2018 All rights reserved. Simple theme. Powered by Blogger. The views, information, and opinions expressed on this site are those of the authors and do not necessarily reflect the official policy or position of any other agency, organization, employer or company.